Source: U.S. Energy Information Administration, Monthly Electric Power Industry Report (Form EIA-861M), and ISO-NE, as accessed through SNL. Of the six states that comprise New England, all but Vermont have deregulated electricity markets that allow customers to choose among competitive suppliers to provide their electricity. Retail electricity prices paid by customers in New England who choose a competitive supplier are much less volatile than wholesale electricity prices, but temporary increases in competitive retail electricity prices occur at about the same time as the largest increases in wholesale electricity prices. Since 2012, New England has experienced four episodes when monthly average wholesale prices increased more than 75% higher than the previous month’s price. In the three months following these episodes, competitive retail prices in the region increased on average 4% compared with the three-month period before the wholesale price increase. In a regulated electricity market, utilities own and operate all aspects of the electric system, including power plants, transmission and distribution systems, and customer meters. State public utility commissions set the electricity rates for these regulated utilities. In a deregulated electricity market, companies compete in markets to generate and sell wholesale electricity to retail suppliers, and customers pay for this electricity in the supply portion of their electricity bills. Retail choice customers usually sign contracts for fixed or variable prices, which limit the monthly volatility in competitive retail prices. Wholesale electricity prices may increase for a variety of reasons, such as high electricity demand, limited fuel availability, or transmission constraints. As in other parts of the United States, natural gas is playing an increasingly important role in New England’s electricity generation mix, rising from 15% in 2000 to 48% in 2017. In recent years, the region’s wholesale natural gas and electricity markets have experienced severe, simultaneous price increases during periods of peak demand, partly because of the limited natural gas pipeline capacity serving the region. Despite the increasing prices in recent years, average wholesale electricity prices have generally fallen. The average wholesale price in New England in 2017 was the lowest since 2003, largely because of low natural gas prices, according to ISO New England, the operator of the region’s bulk power system and wholesale electricity marketplace. Regional retail electricity prices can be difficult to measure precisely because they depend on the customer's rate structure, which can differ greatly from company to company. Instead of surveying prices directly, EIA calculates average retail revenue per kilowatthour for each customer sector as a proxy for regional retail electricity prices. Electricity bills are broken down into an energy component and a delivery component. The energy component of electricity prices has the potential to move along with changes in wholesale prices, while the delivery component tends to be relatively stable because state regulatory commissions must approve any changes. However, electricity delivery charges have been increasing in New England as utilities expand their investments in transmission and distribution infrastructure. Residential electricity prices in the region are higher than those paid by the commercial and industrial sectors. Before 2015, competitive retail residential prices in New England were relatively stable. However, in January of that year, the energy component of the competitive retail residential price in New England increased nearly 20% to cover price increases that had occurred during the previous two winters. 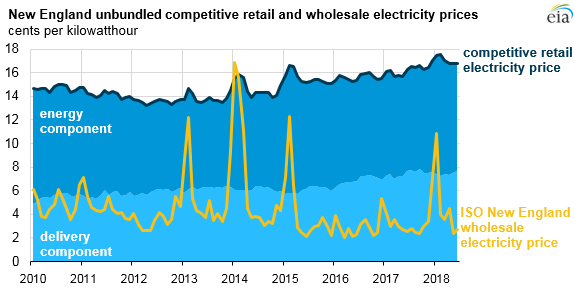 During times of high volatility in wholesale electricity prices, competitive retail prices in the industrial and commercial sectors are generally quicker to respond because customers in those sectors often sign variable-pricing contracts, in which the buyer pays prices more in line with changes in the wholesale market.